One of the outstanding characteristics of Padre Pio’s(Francesco Forgione’s) spirituality was his deep devotion to Mary. His love for the Blessed Mother was one which was present from his earliest years and which lasted through his whole life. In the small town of Pietrelcina where he was born, devotion to the Madonna has been a characteristic of the people’s spirituality for many centuries. Our Lady Liberatrix (Our Lady of Liberty) was the special patroness of the area and was venerated in the main church. Every year there was a festival in her honor with a procession through the streets. The Forgiones were an extremely devout family. When the church bells rang every morning the family gathered for morning prayers. They went to church every day and prayed the Rosary together as a family every evening. Prayer came before all other activities in the household. Maria Giuseppa, Padre Pio’s mother, also had a great devotion to Our Lady of Mount Carmel. In his letters to his spiritual directors, Padre Pio called the Blessed Mother, “beautiful Virgin Mary,” “most tender mother of priests,” “Mediatrix of all graces.” In Our Lady, he saw the advocate of sinners, the most beloved, the consoler. He frequently referred to Mary simply as “Mother.” Reciting the Angelus he rarely managed to restrain his emotions and when he spoke about her it was not unusual for him to shed tears. Padre Eusebio Notte, personal assistant to Padre Pio, once said to him, “You see Our Lady, don’t you?” He answered, “She comes to me whenever I need her.” He also said that she remained beside him when he heard confessions. “Her loving care toward me cannot be described in words,” he said. Padre Pio’s love for Mary was evident as he prayed the Rosary whenever there was a free moment in his busy day and when there were no free moments, he found a way to pray even then. He preferred the Rosary above all other prayers and asked his spiritual children to carry a Rosary with them at all times and to pray it every day. For him the Rosary represented the continual meditation on the profound mysteries of God’s designs for salvation. Father Alessio Parente said, “I was at his side for six years, and in all that time I never saw him without the Rosary in his hands night and day. Our Lady never refused him anything through the Rosary. The Rosary was his constant link with Our Lady. 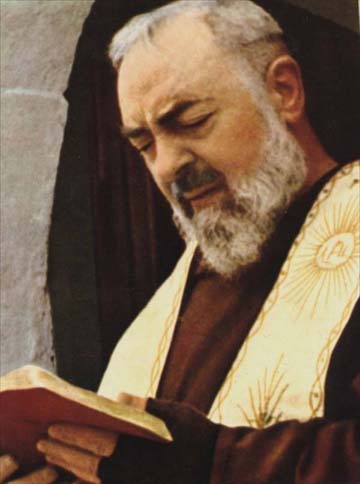 Padre Pio died on September 23, 1968. Padre Pelegrino Funicelli, his brother in religion, assisted him in his last moments on earth. He said that a short time before Padre Pio’s death and with great tenderness, Padre Pio gazed at a picture of Our Lady Liberatrix that was hanging in his cell. He passed into eternal life peacefully, gently. He died with his Rosary. His last words were Gésu, Maria, – Jesus, Mary which he repeated over and over until he breathed his last. Queen of the Most Holy Rosary, pray for us. Gate of Heaven, pray for us.